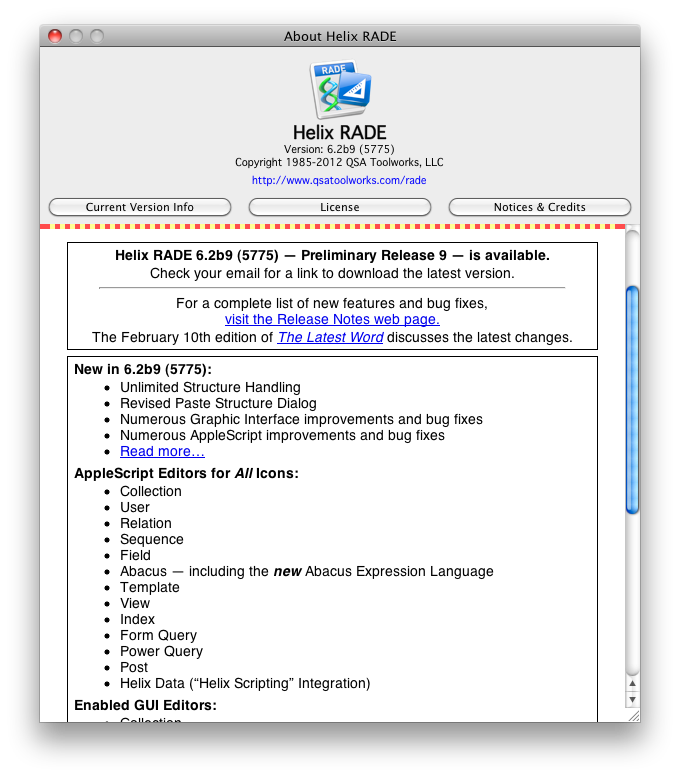 10 February 2012 — The good progress continues with the ninth Preliminary Release of Helix RADE 6.2 for macOS available today. For those out there who haven’t joined us yet, remember that if you’re thinking of joining the monthly plan this month, the initial payment is now $180. The product you receive today benefits from the contributions of your fellow Helix users who have already joined. All subsequent monthly payments will be $20. But if you are thinking of joining up now, why not sign up for the annual subscription instead? For only $20 more, you’ll get every update through May 31, 2012. There should be three more releases between now and then, so it’s like getting two months worth for free. One last note regarding updates: if you are using the Interim Builds and would like to help us test an ‘automatic update’ process, contact Matt. He’s got something you might really like. As always, the complete notes regarding what’s new in this release are found in the Preliminary Release 9 Release Notes. For now, let’s take a giant leap into the enormous news touted above. So what was the big opportunity? Last month’s release bought us to the completion of the AppleScript project. At that time, we alluded to an opportunity that had come our way and that taking advantage of that opportunity might present somewhat of a detour from our path to resumption of work on the graphic interface of RADE for macOS. Of course, whether or not this opportunity really is a detour depends upon how you look at it, so herewith, the news and the spin (not necessarily in that order). Let’s start with the word RADE. RADE is an anagram for Rapid Application Development Environment. So at the core of Helix is the notion that using Helix will get you from point A to point B in less time, or more efficiently, or both. Adding AppleScript capabilities to Helix has already provided us with numerous new ways to speed up the development process, but that only begins to scratch the surface of what is possible. Last month we asked you to consider why we might want you to pay attention to the Paste Structure dialog and some fixes we had made there. Shortly after Thanksgiving, a discussion on the Helix List about the perils of copying and pasting structure was brought to our attention. The specific problem was about the limitation on the amount of structure that could be copied at once, a limit that dooms large pasting operations to failure. We were aware of this limitation, and we had already determined that fixing it, even making it possible to copy and paste entire collections in one step, was not only do-able, but doable in the relatively short time frame of about one month. We posted a message alluding to this, and hinted at a possible solution. However, in the continuous race to outrun our fate, we did not believe we had a month to spare. The AppleScript work was wrapping up and we would not delay the completion of that work for anything. And he was. So he did. And so, after a bit of hand wringing — we really feel like we owe everybody waiting for the return of graphic editors some progress — and checking our bank balance, the decision was made, and off to work we went. And now, little more than a month later, the story can be told: With Helix RADE 6.2 Preview Release 9, available today, you can copy-and-paste an entire collection in a single step. Now you can, of course, still copy-and-paste in pieces, as you’ve been able to do for years and years. But the ability to copy-and-paste an entire collection adds a dimension to Helix that is at once powerful and liberating, not to mention simply astonishing. And it comes at a particularly propitious time because, as always, it takes money to keep this show on the road. But it was also good to have it done before we began working on the GUI, because once you get into that part of the code, you don’t want to come out until you’re done. So, far from being a detour, we prefer to see it as the next logical step in the evolution of Helix for macOS. With this new capability, you can take the structure of an entire collection full of data and paste it into a brand new empty collection, getting a completely empty copy of your collection in mere moments, without having to delete a single record. And if your collection has thousands, hundreds of thousands, even millions of records, this saves enormous amounts of time. Of course, this all works with clippings as well. If you want to see this new power in all its glory, open your largest collection, open the main collection window, select all the icons, then choose “Save Selection as Clipping” from the © menu. In a few seconds you’ll have a complete copy of your collection structure in a portable file. But once you’ve made your entire collection into a clipping, who’s to say you can only use that clipping to create a new, empty copy of the collection? Or to add that structure to a different collection? There’s a third use that will completely blow your mind. 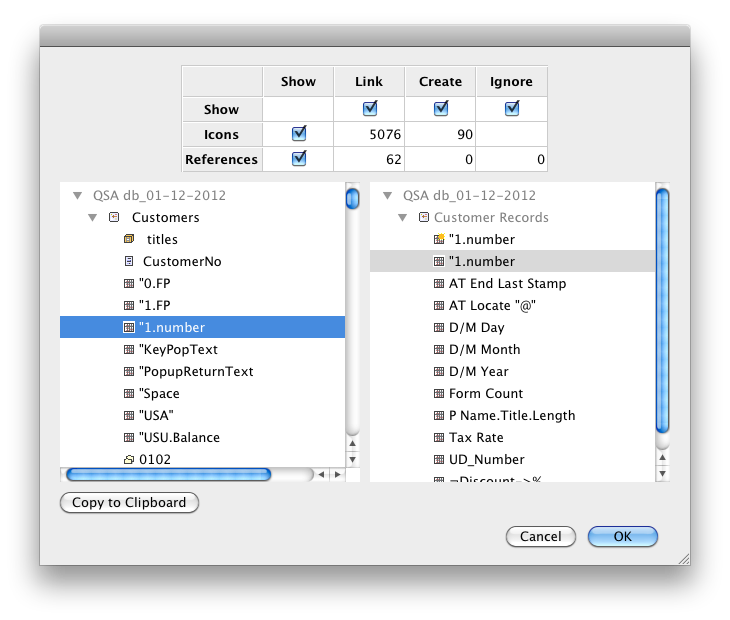 Most copy-and-pasters use the function to replace very specific target objects in the live collection. They create their solution to the problem offline without the pressure of having to do it when the collection is taken down. They they paste it in when it is convenient for the users to be shut down for a much shorter time. But these Helix users know that this capability presents a double-edged sword. On one hand, it enables them to do a thorough job without the pressure of time. But on the other, doing it requires a very carefully planned and executed strategy for getting all the right stuff pasted in without missing anything important or leaving critical links unlinked, rendering functions inoperative. Thus the most exciting part of today’s news is this: the ability to pick up the entire thing in one clipping and paste it right over the same structure. This means that you can now completely change a collection without having to micromanage the details. You can work for days, even weeks or months making massive structural changes and then just drop it in without concern for what gets pasted before what, or having to go back and get some pieces you forgot. And if you happen to have a Helix collection that is in use in more than one location, this is the holy grail of Helix development: a way to update all of them to “the latest version” with an absolute minimum of disruption. It was not enough, of course, to merely expand the range of copy-and-paste structure’s capability. Since you can now work with millions of objects at once, we knew we had to revise the Paste Structure dialog to show off its new capacity. The revised dialog — click on the image on the right for a full size view — features checkboxes you can use to hide the parts you aren’t interested in. Need to find the handful of icons that are going to be created as new instead of updating old structure? Uncheck the Link column and only the new icons are shown. Likewise, reviewing the references (the icons you didn’t copy from the source) is fast and easy when you uncheck the Icons row. If pasting structure was the fastest way to apply changes to a collection before, it’s now turbocharged. But that’s not all! That old annoyance that you couldn’t paste structure that would modify an open window? Gone. Need to rename an icon? Go ahead! RADE will now match it up to the same icon regardless of the name. And if you are one of those people who uses really long names for icons, resize the dialog to fill your entire screen and kiss those truncated names goodbye. Of course, this release also contains other improvements. We restored the ability to jump to an icon in a collection/relation window, revised the “Delete Records” dialog (finally!) and fixed a slew of bugs, some that reach back into the earliest days of Helix. The release contains a major feature upgrade to the graphic interface, which we hope will compel those of you who haven’t joined the Europa Pioneer Plan to sign up. The next release (in March) should herald the arrival of the first of the new icon editing tools. We also plan to begin testing Client/Server and Helix Engine in this version. RADE has proven itself reliable enough that there’s no reason it shouldn’t be useable in production, and the improvements to printing alone should make a significant number of you think about moving your production systems to 6.2. As always, we continue to need your active support. The Europa Pioneer program comes to a conclusion on May 31st. Between now and then we will be formulating the next steps in this journey. We don’t know the details yet, but one thing is certain: anyone who was a Europa Pioneer, whether they joined on the first day or the last, will be in the best upgrade position for the next phase. Another one of those steps is going to involve a meeting of the minds on the subject of Helix and document management. So if this area is important to you, it is time to put on your thinking caps. The future is coming fast.